Luis Suárez: Stuck in the middle? Luis Suárez, the latest member of Liverpool’s one-man team, has been playing rather well this season. At the time of writing, he is 2nd in the top scorers list with 15 goals, while also boasting the most chances created from open play in the league. Even more impressively he manages to accomplish this while nefariously drowning kittens in his spare time*. This increased rate of scoring compared with last season has been much needed due to Liverpool’s lack of attacking options. The question is, what has changed? Firstly, Suárez is averaging a goal every 8.4 shots this season compared to 11.6 last season. Secondly, he is shooting more often this season as he shoots every 15 minutes on average compared with a shot every 20 minutes last season. The combination of these two features would naturally lead to an enhanced scoring rate. So far, so good but can we delve a little deeper into Suárez’s shooting data? Below is a summary of Suárez’s shooting across the last two seasons in the league based on data collected from Opta’s chalkboard services. The data is aggregated positionally to examine how regularly Suárez shoots from a particular location and also how efficient his goalscoring is from these areas. This provides us with indicators of the quality of a shot i.e. the distance from the goal-line coupled with the angle from which the shot is taken. Other factors will impact the quality of the shooting opportunity such as the position of the goalkeeper, whether the shot is attempted with the foot or the head and the number of players between the shooter and the goal. This last point is probably especially important for someone like Suárez who tends to see a lot of his shots blocked. 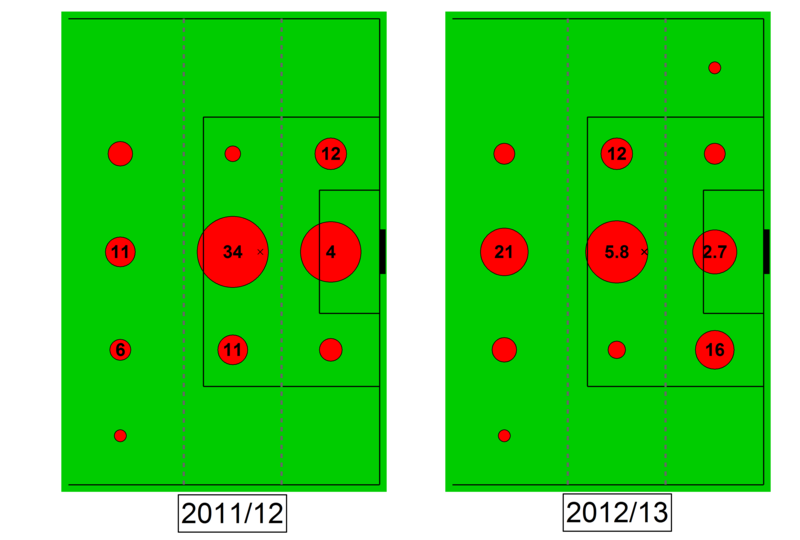 Comparison between Luis Suárez’s shooting and goalscoring from the 2011/12 and 2012/13 seasons. The circles designate areas from which Suárez took a shot from and are sized by the number of shots taken from that area. The areas correspond to horizontal bands from 0-10, 10-20 and more than 20 yards from the goal-line. The grey dotted lines show where the 10 and 20 yard lines are situated. The vertical bands are ordered along the lines of the touchline, edge of the 18 yard box and the 6 yard box. The numbers within each marker correspond to the average number of shots attempted per goal scored in that area. Markers without a number mean that no goals were scored from that area. The first thing to note about the goals Suárez scores is that across both seasons, the vast majority of his goals come from relatively central areas within the penalty area or just on the edge of it. Furthermore, we can see that Suárez appears to shoot a lot from locations where he doesn’t generally score from. His overall number of shots is similar across the two seasons, although there are still 16 matches still to play this season. There has been some change in the areas from which he has been shooting this season, with close to twice as many shots being taken from the central zone that is more than 20 yards from the goal-line. This has been compensated with fewer attempts from the less than 10 yard zone. The main difference between the two seasons is that he is now scoring goals more within the 10-20 yards central area and at a reasonable rate. Suárez is now far more efficient in this zone in terms of goalscoring, with 1 goal from 34 shots last season compared with 5 goals from 29 shots this season. It is the goals scored from within this zone that have led to his increased goalscoring rate. So we can see that compared with himself, Suárez has improved this season. The question is how does he compare with his peers? I don’t have a large enough dataset to do a like-for-like comparison but we can contrast his numbers with data collected by the Different Game blog. The zones are slightly different here but for the central zone within the penalty area, Suárez averaged 7.5 shots per goal last season and 4.5 this season. So compared to the 6 shots per goal average over last season and this, he is better than his peers this season but underperformed last season. There are caveats here in that my figures include penalties, although after his penalty “attempts” last season, Suárez hasn’t been taking penalties this season (not that Liverpool have had many to take and he only took one penalty in the league last season). Furthermore, this is for all players taking shots and potentially you might prefer to compare to other strikers. In general, we can see that Suárez has been more efficient this season in terms of his goalscoring and that his conversion compares favourably with his peers. The reasons for this are less clear and could be due to a multitude of factors including luck, his role within the team this season, Liverpool’s overall tactics and even less tangible factors such as “off-field distractions”. One thing that is clear from this analysis is that if you want Luis Suárez to score goals, he needs to be taking his shots from central areas. Brendan Rodgers has hinted at playing him as a wide-forward now that Daniel Sturridge has arrived; preserving Suárez’s current goalscoring record would be a challenge if he ends up taking more shots from more difficult angles, which may occur due to his natural position being out-wide. Over the last season and a half, Suárez has taken 103 shots from the wide positions for a return of 5 goals. Based on this analysis and watching him play a lot, I would say that in certain circumstances, Suárez is a good finisher but that he is wasteful in terms of his decision making. Since the beginning of 2011/12, just over 40% of his shots were taken from areas out-wide where he rarely scores from, coupled with 36% of all of his shots being blocked (although this has improved this season). While the “scorer of great goals, rather than a great goal scorer” line has been an attractive label for Suárez during his Liverpool career, the analysis presented here indicates that he is more nuanced than that. Mind you, “a reasonably efficient goalscorer provided that he is in a central shooting position within approximately 20 yards of goal who is capable of scoring the odd goal that takes your breath away” is a bit more of a mouthful. Data sources: EPL-Index, Squawka and StatsZone. This entry was posted in English Premier League, Liverpool, Luis Suárez, Shooting and tagged EPL, Liverpool, Luis Suárez, Shooting, Suarez by Will Gurpinar-Morgan. Bookmark the permalink.